For our hundredth edition of this feature, we thought we'd push the boat spaceship out and take the capital into orbit. 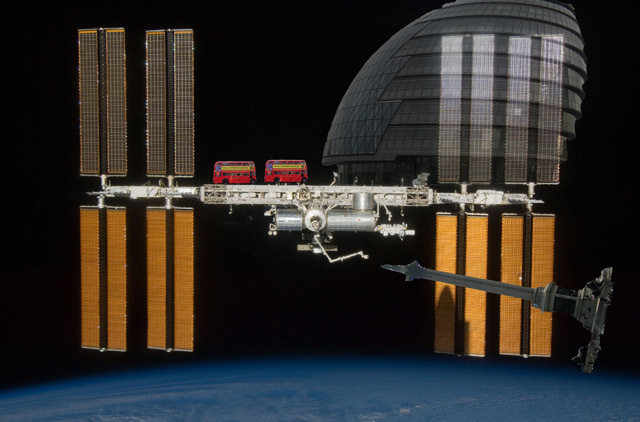 The image is all to scale and shows just how enormous the near-complete International Space Station really is. A traditional Routemaster bus, at a little over 8 metres long is dwarfed by the ISS, which has a wingspan of 108 metres. Even the good ship HMS Nelson's Column, here seen coming in to dock, looks feeble by comparison. Many of the station's modules are not even visible, receding into the plane of the screen. In total, it weighs around 400 metric tons, equivalent to launching 57 Routemasters into orbit. View some of the best Touch Ups here, and please do send in your own creations to tips@londonist.com.